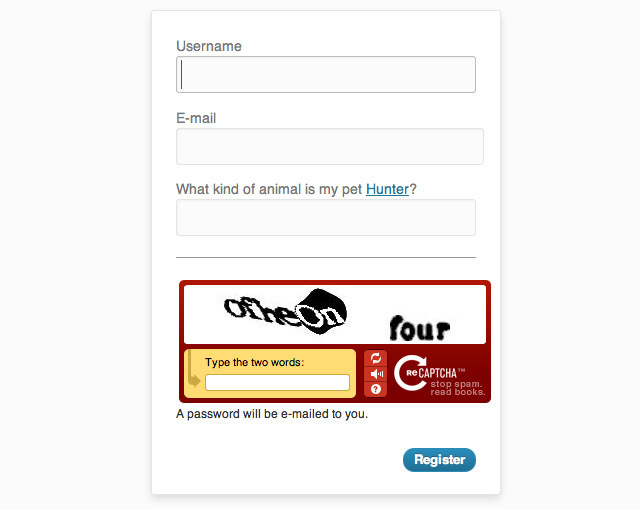 Since I’m thinking about all things WordPress, I’ve updated my Custom Captcha for WordPress into a proper plugin called Stop Registration Spam. The idea is the same as before: to prevent automated registrations, and the spam that comes with them, by posing a question that will be simple for your visitors to answer, but impossible for a robot. It now includes proper configuration via an options page in the WordPress Settings menu, where you can enter a unique question, answer and error message without altering the code. You can download the plugin from the WordPress Plugin Directory, here. i have installed Buddypress(1.6) now as plugin for my wordpress(3.5). Your plugin is a simple but very good method to stop spam bot. in the backend i can create a antibot question and answer pair. But it does not appear on the registration site. can you please help me? Sorry I missed your comment. I’m afraid I have no experience of Buddpress, but the plugin injects the question/answer code into the standard user registration form. If Buddypress is changing or replacing that form in any way, I don’t think this plugin could work without being rewritten.